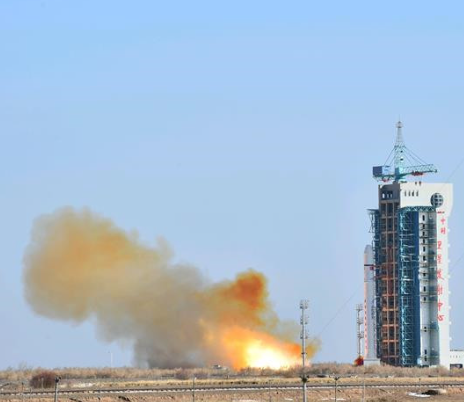 The translated statement from China Aerospace Science and Technology Corporation (known as CASC) states that today's launch contains a new Land Survey Satellite 3 that will be used for remote-sensing of land resources. This Earth Observation satellite launched in a Long March 2D booster from China's Jiuquan Satellite Launch Center in the Gobi desert at 3:10 p.m. Beijing time (2:10 a.m. EST/0710 GMT), according to a report from Xinhua News Agency. Saturday's launch marked the third Chinese space mission in a week, and second Long March 2D launch in four days. A Long March 2D booster launched two SuperView-1 Earth-observation satellites into orbit from the Taiyuan Satellite Launch Center in China's Shanzi province on January 9. On Friday (January 12), a Long March 3B rocket launched two Beidou navigation satellites from the Xichang Satellite Launch Center in the southwest Sichuan Province. Saturday's launch was 263rd for China's Long March rocket families, with the first taking place on April 24, 1970. Of these, 249 have been successful, with eight failures and six partial failures, with an overall success rate of 94.7 percent. The mission completes a successful first week of space activity in what is expected to be an unprecedentedly busy year for China, with more than 40 launches possible. China aimed for around 30 launches in 2017, but two launch issues — notably the failure of the second Long March 5 rocket - halted activities for 89 days. China closed the year with 18 launches — including 16 from CASC — down from a national record 22 in 2016.